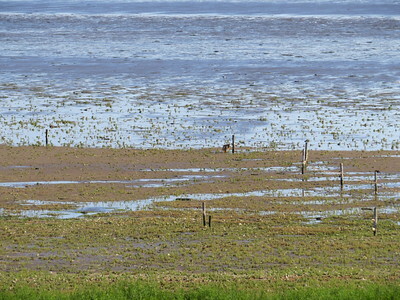 The word wad is Dutch for "mud flat". The area is typified by extensive tidal mud flats, deeper tidal trenches (tidal creeks) and the islands that are contained within this, a region continually contested by land and sea. The landscape has been formed for a great part by storm tides in the 10th to 14th centuries, overflowing and carrying away former peat land behind the coastal dunes. The present islands are a remnant of the former coastal dunes. The Wadden Sea WHS covers a huge area along the coasts of the Netherlands, Germany and Denmark, so it’s an easy site to tick off. Getting a real feel for it though is a whole different story. I believe one should at least try to cover several different areas, and take in both the marine and coastal aspects. Early August 2015 I made my third trip to the inscribed area, still searching for its soul. 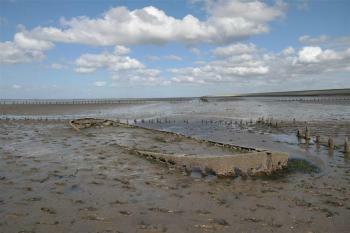 My first visit was in 1982: I was 12 years old and went on a school trip to the Wadden island of Vlieland. It was the first time that I went away for a couple of days without my parents, not counting a disastrous girl scout camp that I left crying already after one night. Vlieland was more of a succes, it’s a really popular holiday island geared to an active vacation. I still have some very funny pictures of that time. Although the islands are outside of the core zone of the WHS, you’ll inevitably cross the Wadden Sea by ferry. So technically – I had been there. In 2011, on my way to the T-listed Eise Eisinga Planetarium in Franeker, I had driven the Afsluitdijk route. The Afsluitdijk is a major causeway damming off the former Zuiderzee and turning it into the fresh water lake of the IJsselmeer. It has been a candidate on its own for the Dutch Tentative List, but it was rejected because it isn’t a national monument and its universal value was seen as doubtful. Halfway there’s a parking lot with a footbridge, from where you can see the IJsselmeer on one side and the Wadden Sea on the other. It’s a windy spot, and on the north side you taste the sea salt on your lips. This weekend I decided to check out the coastal stretch between Den Oever and Den Helder, at the tip of the province of North Holland. First I drove to an area named “Balgzand”. This is the best place to see lots of birds: at low tide large numbers of them congregate at the sandbars to search for little creatures to eat. The zone itself is not accessible, you have to watch from one of the bird hides. A group of some 40 spoonbills were feeding and washing themselves when I arrived. You’ll need a strong lens to take good photos, as the hides are far away from where the action is. I then drove on to Den Oever. This is a small fishing village where not much seems to happen. I parked in the streets and then climbed the seawall that guards the town. Here a combined biking and hiking path gets you closer to the sea, though the tide was still low and there wasn’t much water in sight. I had a pleasant walk along the coast to the Wadden Harbour of Den Oever, a fishing harbour where sometimes seals are seen. I did not see anything but birds however, mostly cormorants drying their feathers in the sun. So that makes 3 visits in total, but I am still not satisfied with the “experience”. It’s really hard to say which part of the designated areas delivers a representative visit for the casual visitor. The official website is not much help as it is more about tourist promotion of the general area than about the WHS. Maybe a proper mud hiking tour (only possible with a guide) would do the trick to at least get a "feel". A couple of years ago we visited the German part of the Wadden Sea WHS with stops in Dorum (where you can have a look inside the Obereversand lighthouse) and Dornum (where you can make a walk along the Wadden Sea following the Heller path). However, to get a proper feel of this WHS we decided to participate in a ‘wadloop’ (mud hike) in the Dutch part of the Wadden Sea WHS. There are various agencies offering such hikes using different routes. We opted for the one starting from the little village of Wierum to the Engelsmanplaat (Englishman sandbank) and back to Wierum. In total it’s about 12 km which takes about 4 hours, a short break on the sandbank included. A guide is recommended (or even obligatory?) 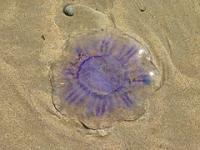 since the sea currents can be very dangerous. The hike itself is quite exhausting as you are walking in the mud all the time and for a fair amount of time also knee/waist deep through the water. Nevertheless it’s a special sensation and in the future we might also try out other routes. I spent some time exploring the German part of this WHS, particularly around the coastal town of Norden, which has good access to mudflats which you can go out and see for yourself. The popular ‘Seehund Station’ is a centre near the coastline of Norden that rescues and looks after injured or orphaned seals. Experts nurse them back to health and then release them back into the sea when they are strong enough to look after themselves. With the expansion of this WHS to unclude the area within the borders of Denmark, I decided to include a visit to this area whilst in the Kingdom. Basing myself in the port city of Esbjerg I made journeys out to the off-shore islands of Romo and Fano. To reach Romo I took a train to Skaerbaek,then a bus from there across a causeway to the island, and then to the southern end at Havneby. From here and from the causeway a variety of marine bird life could be seen. Fano was reached by ferry from Esbjerg. A bus ran the length of the island from Nordby to Sonderho. Sonderho contained a number of examples of traditional domestic architecture, as well as bird life in the salt marshes. At Nordby I encountered the only mammals I saw; a family of seals basking on a sandbank. 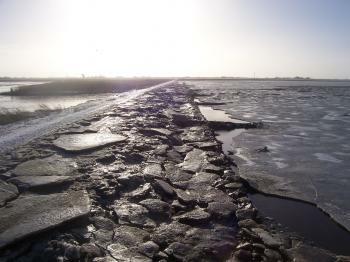 The Wadden Sea WHS area is large. One part in the North of the Netherlands especially around the Lauwersmeer above is the area of my roots. I visited it mid June 2015. 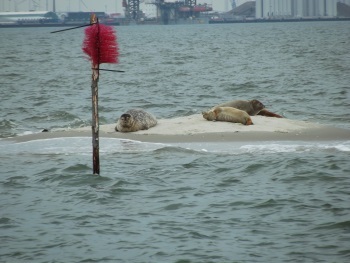 I went for a tour on the Waddenzee on boat, bad weather so only tour. 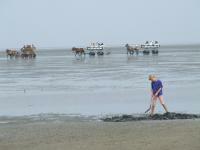 We did some walking on the mud flats, but it was high tide so we could not walk far. And we eat gurnard fish from the Waddenzee, durable fish! It's a great area and for this i ticked of the Dutch part, the Islands are not really part of it. Ah, we saw some seals too of course. Check my site for some photos. I visited this WHS in May 2012. 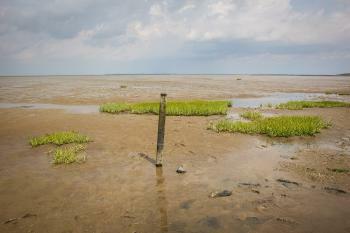 I visited the Netherlands side of the Wadden Sea around the Frisian islands. The highlight of my visit was exploring the Wadden Sea coast of Texel by boat, spotting seals and a huge variety of birds on the way. “Why?” my colleagues asked, as they seem to delight in eking out the weirder destinations that visiting World Heritage Sites takes me. Therefore they had great fun when I unveiled my plans for New Years day 2011. And so that is how I planned my day and that is how it turned out. To walk off the excesses of the festive period I took a stroll to Langlütjen I on New Year's Day 2011. To my surprise there were a few birds flying around near the sea, I saw some Geese (Barnacle?) Ducks (Eiders?) and something that I think may have been a Curlew, but as I said, birds really are not a speciality of mine. I actually enjoyed my walk through the flooded grass lands and walking out on the manmade peninsular gave me a great view of the birdlife around me as I could walk beyond the shoe line even with the tide higher. One thing that surprised me was that the sea was frozen when I finally got to it. I had never seen the sea like this before so that was quite rewarding. It also meant that the few birds that were around clustered in small ponds of water that had remained unfrozen, making them easier to spot. I won't pretend that I have seen the best of the Wadden Sea, but then again it was never a site that was going to really appeal to me. It was however another example of how hunting out World Heritage Sites can take me well of the path I would normally choose, and that was the most rewarding this about it. Oh yeah and it kept my colleagues entertained on my return to the office over a few tasty Bremer Kluten, now I just have to work out which site to trek to next. Texel Island - reached by ferry from Den Helder, then by bus to Oudeschild, a small port facing the Wadden Sea. From here there are excursions by boat to see the wildlife on the sandbanks. Terschelling Island - reached by ferry from Harlingen. From the port on the island I walked to Green Beach to see the bird life there, but saw more from the deck of the slow ferry on the way back to Harlingen. Norddeich - from here there are ferries to Norderney and Juist Islands. I took an informative cruise to the National Park to see the seals and birds on the sandbanks adjacent both islands. Wilhelmshaven - saw views over Jade Harbour from the Wattenmeerhaus, a museum of the fauna and flora of the Wadden Sea at South Beach. Cuxhaven - I just timed it correctly to catch low tide at Dunen Beach in order to take a trip by horse and cart out onto the sandbanks. I also visited the National Park exhibition at Sahlenburg Beach. Sylt Island - This island is accessible only by train or boat. I took the train to Westerland, then a bus to Hornum on the southern tip of the island. Then I took a boat cruise via the Halligen to Husum, back on the mainland. Archipelagos: (Deposition) "The Frisian Islands, also known as the Wadden Islands or Wadden Sea Islands, form an archipelago at the eastern edge of the North Sea" (Wiki). Some parts of some of the islands are within the inscribed area though the biggest/most developed are excluded. Amber: The Island of Neuwerk has an amber museum and a visitors' activity is searching for Amber torn up from the sea bed by storm surges. 263 Community Members have visited.